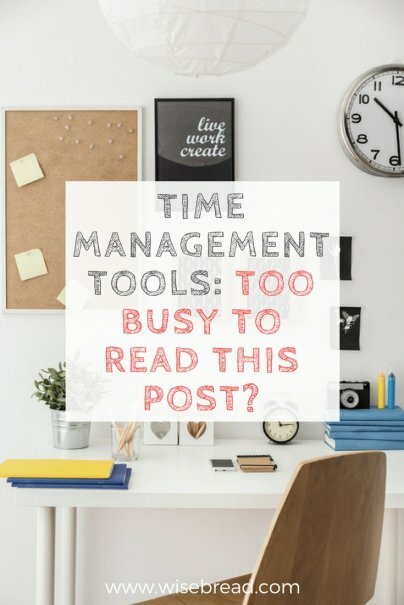 Time-Management Tools: Too Busy to Read This Post? Home » Life Hacks » Productivity » Time-Management Tools: Too Busy to Read This Post? I get up at 5:30. I run. I eat. I work. I go to the gym. I write for this blog. I attempt to keep my house somewhat presentable. I read. I go to bed. Then I get up at 5:30. I made it through both undergrad and grad school without a time-management strategy, but now that I’m in the working world, I’ve decided that I’m in serious need of some tools for managing my time better. Here are the best ones I’ve found so far. Remember the Milk is one of my favorite online time-management tools. This free task manager allows you to keep track of your to-do list in ways you’ve probably never imagined before. Not only can you enter tasks and due dates, rate them by priority level, and sort them by category (like work, personal, and study), but you can also set reminders (by text, e-mail, or AIM), e-mail to add tasks, and manage tasks with the calendar you’re currently using, including Google Calendar. I’ve also added a Remember the Milk app to my Android phone to manage my to-do list on the go. And, as an added bonus, Remember the Milk is known to be a helpful tool for followers of the Getting Things Done system. Evernote is a personal digital assistant that lets users capture interesting websites, store PDFs, and take notes. The main premise of Evernote is capturing everything (thoughts, documents, websites, pictures, and audio files), organizing them, and helping you find things later when needed. I’ve found Evernote to be insanely helpful in planning my wedding next year — as I find pictures of things online, I can snap and save them to my “Wedding” file. It’s also great for planning trips, keeping lists of recipes or restaurants you’d like to try, or keeping documents for classes organized. The basic version of Evernote is free, although you can upgrade for $5 per month in order to save Word and Excel documents, search PDF documents, and upload more documents. Thymer is a project-management tool that bills itself as being easy to use for people who hate task management. Simply enter in a task that needs to be completed and Thymer will figure out who needs to do it and what the deadline is. Another great feature of Thymer is the ability to keep track of time spent on tasks. Not only is this useful if you’re a freelancer who bills clients by the hour, but it’s also wonderful for notorious time-wasters such as myself. Keeping track of time spent surfing the web versus working on a project at hand is a powerful time management tool. Thymer has a free plan for individual users, although it has limited features compared to its subscription plans. Paid plans range from about $4 per month (for a single user) up to $80 per month (for unlimited users and usage). Toggl is a time-tracking system that aims to help you increase productivity. Just click on the timer on the app, type of a description of your work, and Toggl keeps track of how much time you spend on that particular task. Click the timer again to stop, and you can see how much time you’ve spent instantly. You can access Toggl from the web, from your phone, or as a standalone app on your desktop. If you fill in time on the desktop app, it will automatically sync up with the web once you get online again. Toggl also generates reports that can help you refocus your time on more profitable projects and kill time-wasters. Like Thymer, Toggl has a free version. ToodleDo, like Remember the Milk, is an online to-do list that allows you to create folders for your various task categories, assign priority levels, and search to-dos. ToodleDo also has a cool feature called the Scheduler, which the developers describe as perfect for when you’re not feeling particularly motivated or don’t have the energy to be as productive as you’d like to be. All you need to do is tell the Scheduler how much free time you have at hand, and it will tell you what to do based on upcoming due dates, priorities, time estimates, or other characteristics. Perfect for me on those indecisive Sunday afternoons! So there’s the long and short of some of the most useful (and free!) time-management tools on the web. I’m currently giving each one a trial run to see which work best for getting my hectic schedule in order. If all goes well, I’ll avoid becoming part of the 47% of women in the BCG Study who say that "demands on time" is the number one challenge in their lives. I’ll let you know how it turns out! What are your thoughts on time-management tools? Have you tried any of these, or are there others out there you like better? Share your thoughts in the comments! I can't say enough good things about Remember the Milk. It's by far my favorite and most used app on my phone. As far as to-do lists go, it's the best. I've used Toggl some too. It's very good at what it does. I can't say I'm much of a power user, but I use it to keep track of how much time of spend on homework, in each subject, and it works like a charm. Great integration with it's web interface (with the mobile interface) too. I completely agree that Remember the Milk is invaluable, and everyone I've talked to seems to think the same! I'm learning how to better use it with Getting Things Done, too. Good to know your thoughts on Toggl also - thanks for sharing! I'm a Remember the Milk lover too...when I think back to all the loose pieces of paper with various to-do lists I used to keep on my desk, I shudder. Funny that you say you are not a working mom or a lawyer. I am both, and no time management scheme actually adds hours to the day. Which is really what I need. I'm here reading this because I've reached that point you allude to in your article, where I am overwhelmed and can't even start what I need to do. Guess I will try your Toodledo recommendation and see what it tells me! Amen. I am too, and at some point time management systems are no longer the issue. We need to prioritize: decide what we can do, what we can delegate, what gets hired out and what just isn't that important. Evernote is one of my all-time favorites. It's my digital reference system and note taking program. I used to use toggl a lot, till I found aTimeLogger. The way I use time tracking is mainly for my life, not just work projects. So I track 24/7 where my time goes and I found aTimeLogger a little better to use for that. For a task manager, I can't endorse Omnifocus enough. It's iOS/Mac only, but in my opinion the best task manager out there. It is surprising to see Talygen not mentioned in time management tools list. Its time to update the list. True Time Tracker, really great and powerful time tracking software by Talygen http://talygen.com.